Mohammad Masud Rana, upazila primary education officer of Raipura, Narsingdi won the Best Upazila Primary Education Officer Award in Dhaka division this year. The selection committee of the Dhaka divisional commissioner office has recently recognised Masud as the best officer for his outstanding achievements. 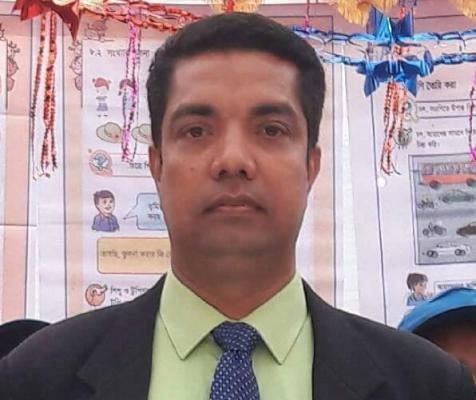 Masud proved his mettle as an adept administrator by enlisting some 1201 teachers of his upazila into the national portal in a span of just three days. His fast and proficient performance earned him a thank letter from the deputy commissioner of Narsingdi besides making him first among all upazilas of the country in this particular job. The dexterous officer has also undertaken some major initiatives to develop and expand the primary education of Raipura during his brief tenure there. Masud introduced mid-day meal funded by local elites at different primary schools besides distributing laptops and desktops among the students and teachers. The efficient officer could earn applause from parents by ensuring school dress and cub dress, granting sports and teaching materials and introducing prizes for teachers and students. He also employed some 120 para teachers in different schools suffering from an acute shortage of adequate teachers through SMC and community mobilisation. In order to develop the environment of the schools of Raipura, the upazila officer inspired students and teachers for gardening on school premises. Masud has also undertaken a number of development moves including erecting boundary walls, establishing approach roads and filling playgrounds of the schools. Keeping the hygiene of the teachers and students in mind, he has also taken initiatives to strengthen sanitation activities in every primary school of Raipura. The officer also created accommodation for a number of teachers in remote char area by inspiring local elites to lodge the teachers at their homes. As a result of his tireless efforts, sports and extra curriculum activities has received greater attention at different schools, contributing to evolving the hidden talent of the students. Testifying to his philanthropist mind, the education officer has arranged adequate number of benches for the students of Ananda schools of Raipura. He could draw admiration of teachers and employees of primary schools through putting impetus in providing different administrative services to them. Earlier, the competent officer was also recognised as the best upazial education officer four times in district level besides standing first in digital fair three times in upazila level. A man from Gazipur, Masud Rana received first class in his BBA and MBA degrees from Dhaka University. As he never received a second class through his life, he also finished his professional B.Ed degree with a first class. Prior to joining the government service, he has put his signature of success in different private jobs as well.